Xbox just unloaded a ton of news today from their Gamescom presentation. Here’s some of our notes from the event. At E3 this year, Microsoft didn’t really drop many surprises outside of the announcement of backwards compatibility and a wellness check on some of the more anticipated games. However, at the end of the show, Phil Spencer confirmed that Xbox would be showing off games at Gamescom 2015. Well, we are here and this is what Xbox had to show off. The show kicks off with a sizzle trailer showing off the E3 games. I saw Tomb Raider, Fable Legends, Forza, Halo and the new Gears. We finally see more gameplay for Quantum Break. The best way to describe this is Gears of War with time controlling abilities. This isn’t a bad thing and the colors really are popping out during the demo. It appears there are going to be some cinematic puzzle elements as well, because at the end of the demo you are sitting in a room trying to rewind and fast-forward through time. They also showed off a teaser trailer for the Quantum Break TV show. The show will follow the villains of the game and appears to be a tech-based drama, moderately contrasting Mr. Robot. Crackdown 3 is the next game shown. Everything is pre-alpha footage, to be fair it looks a bit hollow but should be expected if the game is still in development. The new city looks huge, but the star of the trailer is the 100% destructible environments. In the trailer they bring down a skyscraper and a few bridges, the building topples others when it goes down. They announce in the trailer that the game will use Xbox Cloud to multiply the power of the Xbox One by 20 times. I… I’m not even sure what the hell that means. There will be a multiplayer beta early Summer 2016. Honestly, the game could be great. I can’t wait to see it in a completed state. Kamiya walks out and announces that we will see some live gameplay of Scalebound for the first time. The main character looks like a generic dude-bro at first. He has a dragon-arm and can communicate with his giant dragon. It appears that the ARPG combat music actually comes from the main character’s headphones, so that is fun. I want to be real with you guys, Scalebound looks like it could be Platinum Games’ magnum opus. Directing your dragon to major targets while you hack and slash your way through enemy soldiers is almost an overdose on cool. At the end of the demo, there is a giant mantis-beast that attacks the hero and dragon. The hero transforms into some sort of dragon-man hybrid and unleashes some devastating moves on the stunned monster. Kamiya smugly shows off at the very end that you will be able to team up with other players, but there is no word if it is only for certain parts or a different mode. However, it’s obvious that you can have different dragons. Neat. Xbox One will get full functioning DVR abilities with remote access. Too bad the hard drive is so small. They also confirm that there will by crossbuy and crossplay with Xbox One and Windows 10. The future is here, people. All Games with Gold titles for 360 going forward will all be backwards compatible. Your Xbox One library is going to get unmanageable. Killer Instinct for Windows 10 is going to feature cross platform play. Season 3 kicks off March 2016 and it looks like the first character will be Battletoads’ Rash. I saw him use a super speeder in combat. I’m sold. ID@Xbox glosses over some games that I can’t honestly recall. Mostly indie stuff, which is neat, many of those games deserve the reach of easy console access. There are going to be 150 indie games making their way to Xbox One in the next 12 months. Allow that to sink in for a few. Igarashi is brought out to briefly discuss Bloodstained: Ritual of the Night. There’s no gameplay but he does show off a new character, it’s a guy with no name yet, but he uses dual swords and seal-based magic spells. After quickly noting that Cities: Skylines will be coming to Xbox One before PS4 next year, the bring out Ron Gilbert. If you don’t know who Ron is, he is the guy behind Maniac Mansion and the Monkey Island games. He shows off a bit on his new game Thimbleweed Park. It looks so much like Maniac Mansion that I can’t help but be excited. It’s a point and click adventure and looks to have an awesome atmosphere. Let’s keep that point and click adventure dream alive, folks. The next batch of Xbox Game Preview games are announced, that’s early access for the uninformed. Sheltered is a bombshell simulator game made by Team 17. The dinosaur first-person survival game is coming to Xbox One as well, it looks fun. Rivals of Aether (wat? ), Starbound and We Happy Few are all going to hit next year. We Happy Few looks cool and kind of reminds me a bit of Dishonored somehow. Jens Bergensten comes out to re-announce that Minecraft on Windows 10 is free for anyone that bought the java-based game, all you need to do is log into your Mojang account. However, he also unveils that Cobalt is coming to Xbox One as well. This game is like Super Meat Boy meets twitch-based shooter. It looks wild. There’s a trailer for Dark Souls 3. The game looks a bit brighter than 2 and seems to incorporate faster paced combat elements from Bloodborne. As this is the FINAL Dark Souls game, I expect big things. Homefront: The Revolution is brought out of cold storage. The trailer paints a picture of America trying to survive after being overrun by the Unified Korea dictatorship. The combat looks a lot like it did before, however it seems that you can get quest queues via your comms unit while you traverse the world. I saw a RC car bomb and travelling via dirt bike. Homefront: The Revolution still has promise. FIFA stuff. Looks like Xbox One players will get a free Legend Card for Ultimate Team and 10% off their purchases. I think I heard someone cough in the audience. After some eSports pageantry for Halo 5 that includes 2 guys yelling excitedly over pre-taped footage, Microsoft announces that the 1TB Halo 5 Xbox will be available to pre-order NOW. They are also taking a run at the eSports scene with Halo World Championship, it will be this winter and will have a prize pool of $1,000,000. That’s about 1/15 of DOTA 2’s pool, for comparison. Forza is here, he talks about partnerships and stuff. I zone out because car games are boring and he keeps saying “drivatar”. It causes me ears to bleed. Then they start showing rain effects. I live in Florida and driving in rain is a common occurrence, this rain looks more realistic than the stuff I see on a daily basis. Also saw some fish-tailing, welcome to my regular hell. This could be interesting…. MAYBE. Rise of the Tomb Raider finally gets some real gameplay stuff outside of flashy cinematics. Lara slits a guy’s throat ear to ear and mercilessly slaughters enemy PMC soldiers. There seems to be a ruthless aggressiveness about her now that is interesting if you have been following the canon-based comics from Dark Horse. Lara creates distractions with items around the camp and even throws together a quick IED to clear an area out. Rise of the Tomb Raider could be something special. On top of it all, the lighting effects are breathtaking. This game looks far more prettier than the last. The show closes with some chatter about Halo 5, it seems that Microsoft really is going all in on this one. They should, it is their flagship title. Bonnie Ross hints at something else, and there is a trailer shown of a bunch of Spartans getting owned by something big. It turns out to be a Brute and he mocks them before the words HALO WARS 2 appear on the screen. Leave it to Microsoft to drop another Halo-bomb at the end. That ends the show, and we are left to count down the days until November, when the ball gets rolling on much of the stuff shown here. Quantum Break – Cool. Looks like a creative 3rd person cover-based shooter. Time stuff is always fun. TV show looks like it has potential. Scalebound – Final Fantasy adjace. This game probably has the most potential of any at the show. 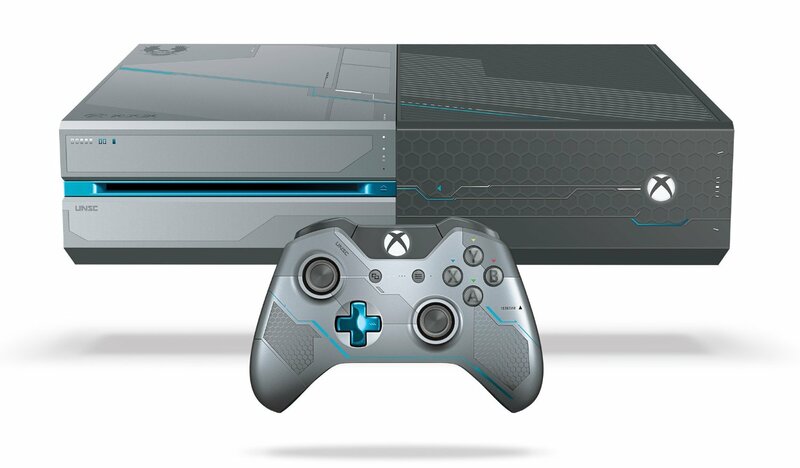 Xbox One – New features, including crossbuy and play, along with a full functioning DVR. ID@Xbox – Could set the stage for indie devs making it to the big leagues. Bloodstained and Thimbleweed Park look to be their flagship titles. Homefront: The Revolution – It still exists. Forza – Bringing the rain. Rise of the Tomb Raider – Billed at 3 times bigger than the last game, Lara appears to have taken a much more aggressive approach to an even deadlier enemy. Halo things – Xbox is doubling down on Halo. Not only are they launching a special console for the game but they are also putting a lot into trying to build a legitimate eSports scene around it. Halo Wars 2 exists, if even in teaser-trailer form.